To learn from the sperm whales of the Caribbean as to better help conserve and protect the populations and cultural diversity of cetaceans worldwide. Our research program integrates both a long-term observational approach and innovative technology to address key questions about this marine apex predator. While the project's main objectives focus on social behaviour and vocal communication, our integrative program incorporates biological sampling for genetic, diet, and blubber analysis; as well as passive acoustic monitoring and photographic assessment of cetacean populations for local governments. How groups of whales recognize each other and make social and movement decisions on a biological relevant scale remains completely unknown. We are currently undertaking an unprecedented study which seeks to understand how the sperm whale, a nomadic marine apex predator, mediates its social interactions. In collaboration with Peter Madsen of the Marine Bioacoustics Lab at Aarhus University, we are using innovative animal-borne tags deployed to conduct a controlled playback study with a paired design (familiar call vs unfamiliar call) to test hypotheses of both individual and cultural group recognition. It is this kind of analytical framework that has driven the study of birdsong into one of the most productive areas of behavioural ecology. 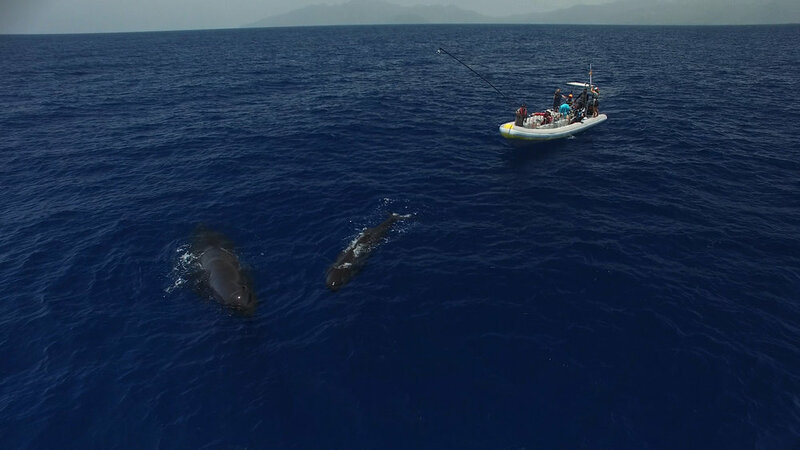 In collaboration with Fredrik Christiansen from Murdoch University's Cetacean Research Unit, we are assessing the body condition of the Caribbean sperm whale community using drone photography. This will also allow us to compare our two methods of measuring the whales, one acoustically using their clicks and this new drone based measurements of body size. We hope to also use drones to study how whales respond to the actions fo whalewatching boats and swim-with-the-whale tours. Sperm whale units are generally matrilineal, which suggests kin-selection may contribute to the formation and maintenance of their long-term social units. However, the long-term social datasets matched with comprehensive genetic sampling are rare among marine mammals. By pairing our detailed social history of the individuals we study and skin sampling from across the last decade, Christine Konrad has a unique opportunity to examine kin-selection’s role in sperm whale societies and to ultimately better understand the selective pressures driving sperm whales’ multi-levelled social structure. Ship traffic around the world has been increasing by 3% per year and this has contributed to an increase in lethal collisions with whales worldwide. This risk is particularly acute around island chains, such as the Caribbean, which import the vast majority of their goods and have high levels of ship traffic between islands. By using the DSWP's long-term sperm whale sightings database in conjunction with AIS vessel position data, Michael Petroni will be evaluating the degree of interaction between whales, ship traffic, and fish-aggregating devices off Dominica . This could facilitate the creation of national and regional shipping lanes, and will be particularly important prior to the expansion of the Panama Canal and increases in regional shipping intensity. Sperm whale mothers make deep foraging dives during which their dependent calves do not follow them to depth. Mothers face a tradeoff of needing to dive to meet the increased energetic demands of milk production and the increased need to spend time at the surface with their calf. Using Dtags deployed synchronously on mother-calf pairs, Pernille Tønnesen hopes to address questions about how mothers cope with the extra energetic demands of a calf, how calves synchronize with their mothers, and how the ontogeny of diving. An acoustically-based method of counting and identifying whales would be of great benefit, as it would allow for much simple method of collecting data over year periods outside regular field seasons. Wilfried Beslin is using machine learning to develop a tool for automatically compiling distributions of sperm whale IPIs from clicks present in acoustic recordings, and use these to estimate the number of whales vocalizing and, where possible, unit identity. The following organizations have contributed to the research through in-kind donations, logistical support, or providing opportunistic data to supplement photo-identification efforts.